Mish's Global Economic Trend Analysis: Next Phase in Currency Wars: Yen Plunge, Yuan Devaluation, and "Tidal Wave of Westbound Deflation"
Next Phase in Currency Wars: Yen Plunge, Yuan Devaluation, and "Tidal Wave of Westbound Deflation"
The Yen currently trades about 115 to the US dollar. At the end of 2011 the Yen was about 77 to the dollar. That is a decline of roughly 33%. Yet, Japan's inflation barely budged. Japan's prime minister Shinzō Abe is not pleased. On October 31, the Bank of Japan pledged "Unwavering Determination" to Get 2% Inflation. The Yen plunged and Nikkei futures rose limit up. To quote Yogi Berra, "It's tough to make predictions, especially about the future." I know full well, having made some spectacular calls but also some very bad ones over the past few years. Nonetheless, via email, Society General's Albert Edwards expects a "Tidal Wave of Westward Deflation" and "Yen at 145 to US Dollar by March". Forecast timidity prevents anyone forecasting ¥145/$ by end of March – so I will. 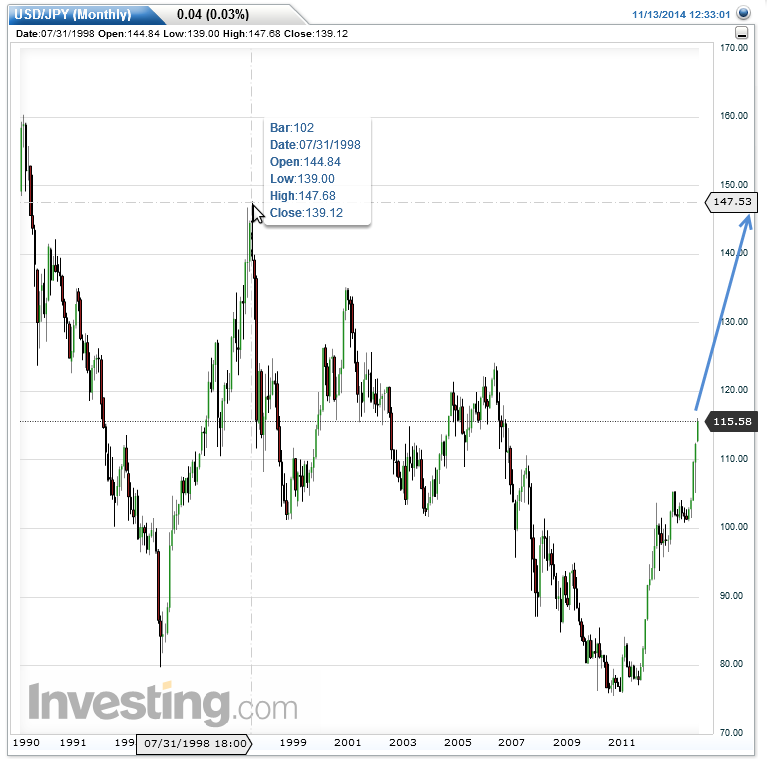 We revisit the most important chart investors should be focused on, namely the yen/dollar chart. The market still does not seem to have grasped the significance of this phase of currency wars. It reminds me of the 2006/07 period when falling US house prices and then widening corporate bond spreads were totally ignored by upbeat equity investors until it was too late. The yen is set to follow the US dollar DXY trade - weighted index by crashing through multi-decade resistance - around ¥120. It seems entirely plausible to me that once we break ¥120, we could see a very quick ¥25 move to ¥145, forcing commensurate devaluations across the whole Asian region and sending a tidal wave of deflation westwards. It it is worth noting just how aggressive the BoJ has become with the central bank balance sheet already at around 55% of GDP and rapidly heading higher still! Japan is an economy a third of the size of the US doing roughly the same dollar QE as the Fed did at its peak! The move to crank up the Japanese printing shouldn't have been a surprise. These guys at the BoJ, unlike the ECB, WILL do whatever it takes. Did anyone see FT Alphaville's highlighting the stunning transcripts of former US Treasury Secretary, Tim Geitner's book, which revealed that Draghi was basically making it up as he went along and had no actual plan in his back pocket. [See Draghi’s ECB Management: The Leaked Geithner Files] The problem for the eurozone is that Draghi is getting increasingly long on promises and pretty disappointing on delivery. Japan is just on a different page, league, or indeed planet, altogether. For those who say the US simply won't allow the yen to fall so rapidly, I would reply that Japan too won't want to annoy the US too much, especially as they rely on the US military umbrella at a time of increasing friction with China in the South China Sea. Nevertheless I simply think Japan will lose control of the situation given the quantity of QE being spewed into the markets and unless the US, the eurozone, or indeed Korea, is prepared to come remotely close to Japan's rate of QE, jawboning currency stability will do very little. But I do believe the yen devaluation will drag down other competing currencies in the Asian region, which brings us onto China. After a record 32 successive months of deflation at the producer price level, China has suffered as much PPI deflation over the past three years as it did in the immediate aftermath of the 1997 Asian crisis. Do investors really think China can cope with a devaluation of the yen from here? They simply can't tolerate this and they won't. They will devalue. The above chart may be easier to read (especially expanded) but it is inverse. In contrast to Edwards' chart, up is actually a decline in currency value. Edwards sees a decline in the Yen to 145 to the US dollar. If so that would be a currency decline of about 50% since 2011. 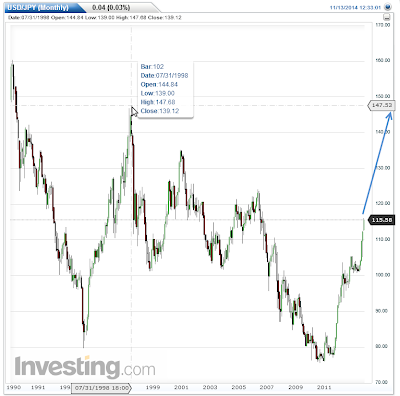 At that point, the Yen would be where it was in July of 1998, so the move is not as shocking as it may initially sound. Next phase of currency wars is underway. Abe will "do whatever it takes" to produce inflation in Japan. Abe will soon "lose control of the situation". Yen sinks to 145 to US dollar. China will respond by devaluing Yuan. "Tidal Wave of Deflation" heads West. US brands China a "currency manipulator"
Points 1-6 from Edwards. I added points 7-9, as explained below. It may play out this way, but if so, perhaps it takes longer than March. I will give a big tip of the hat to Edwards if it plays out that way within a couple of years (whether or not my points 7-9 happen). My only disagreement with Edwards is on a tangential issue. The problem in the eurozone is not Mario Draghi or Germany. Draghi cannot do "whatever it takes" to spur credit and inflation because the primary problem in the eurozone is structural, with the euro itself. A key secondary problem is productivity issues between member states. The secondary issue cannot be resolved (except at the expense of Germany and the Northern states) if every country remains on the Euro. There is little Draghi can do to spur credit creation in Europe given the above constraints, productivity issues, bank leverage, the Maastricht Treaty, and increased infighting among member states, some of which want to violate the treaty and others not. Draghi's Next Move - Back to Italy? Neither Draghi, nor Germany, nor any Asian countries will be pleased by Japan's attempt to boost exports by driving down the Yen. This will make it all the more frustrating for Draghi. Calls will mount for Draghi to "do something". I suggest Draghi might just quit, then head back to Italy, perhaps as next president, perhaps to run for prime minister. If Draghi is smart, he will get out of the way before crisis hits rather than during the next crisis. When China reacts (and China will react if the Yen hits 145 to the dollar, perhaps before that point), the US will scream and the protectionists in Congress will call on Obama to label China a "currency manipulator". Political necessity ensures the largest screams will not be about Japan, but about China, when China reacts to pressure from Japan. Labeling China a currency manipulator would of course make matters much worse, but that is precisely what I expect from Congress should China devalue. Global trade would then collapse amidst competitive currency debasement. Finally, under such a scenario, gold would likely soar.